Ask your average golfer the most difficult clubs in the bag to hit solidly and the answer will likely be fairway woods (or metals, as they’re sometimes called). And the problem most often cited is difficulty getting fairway wood shots airborne. 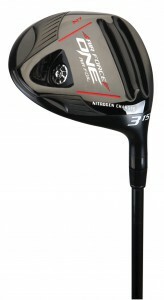 Fortunately, the recently minted Air Force One Air Foil Fairway Woods are here to help. Available in 15-degree 3-wood and 19-degree 5-wood models, the new Air Foils follow the Air Force One brand’s easy-to-hit design objective, including irons introduced earlier this year and the Air Force One driver. The driver and fairway woods feature “Nitrogen Charged” technology, essentially injecting compressed nitrogen into the clubhead to reinforce it without adding weight. This in turn increases the “trampoline effect,” the speed at which the club face returns to square at impact, with ball speed and distance increasing accordingly. The “dual slot wave” sole of the club is designed to generate a high launch angle and tight dispersion, that is, less “spraying” of shots. With the new Air Force One Air Foil Fairway Woods, you don’t have to choose.